Prime Minister Saad Hariri highlighted the government's intention to fight corruption, a statement by Hariri's Press Office indicated on Sunday. 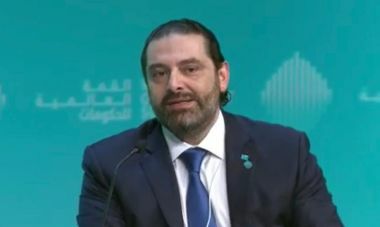 "The President of the Council of Ministers Saad Hariri highlighted the government's intention to fight corruption, adding that the most important challenges facing the government will be squander and corruption," the statement indicated, noting that Hariri was replying to questions from a number of television stations in the UAE. Dubai - Prime Minister Saad Hariri conferred with Vice President and Prime Minister of the UAE and Ruler of Dubai Sheikh Mohammed bin Rashid Al Maktoum and Managing Director of the International Monetary Fund Christine Lagarde, on the sidelines of his participation today in the "World Government Summit" in Dubai, a statement by Hariri's Press Office indicated on Sunday. "On the sidelines of his participation today in the "World Government Summit" in Dubai, the President of the Council of Ministers Saad Hariri met with the Vice President and Prime Minister of the UAE and Ruler of Dubai Sheikh Mohammed bin Rashid Al Maktoum, in the presence of Dubai’s Crown Prince Sheikh Hamdan bin Mohammed bin Rashid Al Maktoum, the Minister of State for Foreign Affairs Anwar Gargash, the Minister of Cabinet Affairs and the Future Mohammad Al Gergawi, the Minister of Economy Sultan Bin Saeed Al Mansouri and the President of the Dubai Civil Aviation Authority and CEO and chairman of the Emirates Group Sheikh Ahmed bin Saeed Al-Maktoum," the statement indicated. "The meeting was also attended by members of the Lebanese accompanying delegation. Talks focused on the latest regional, Arab and international developments and bilateral relations," the statement added. Dubai - Prime Minister Saad Hariri held talks Sunday with Crown Prince of Abu Dhabi and Deputy Supreme Commander of the UAE Armed Forces, Sheikh Mohammed bin Zayed bin Sultan Al-Nahyan, on the sidelines of his participation in the "World Government Summit" in Dubai. Talks between the pair reportedly touched on the situation in Lebanon and the region, as well as the bilateral ties between the two countries. The meeting was attended by UAE Minister of State for Foreign Affairs Anwar Gargash, Under Secretary of Abu Dhabi Crown Prince's Diwan Mohammed Mubarak Al Mazrouei, former Minister Ghattas Khoury and Lebanese Ambassador to UAE, Fouad Dandan.